The Eiffel Tower creates great dorm room decorations. It's astonishingly beautiful and whether you've seen it or have always wanted to visit it but haven't yet, it's a view that you wish you could look at every day. 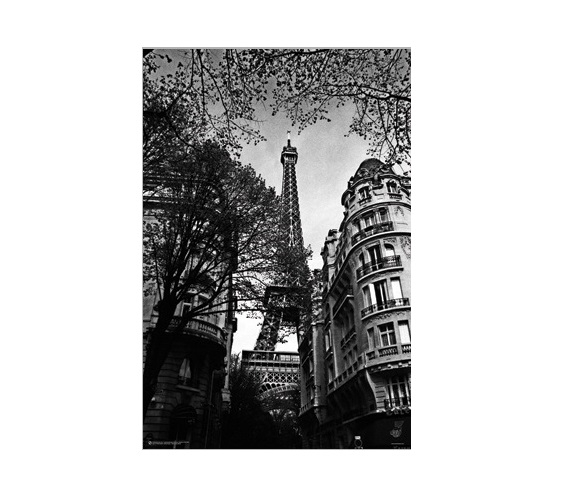 With our Eiffel Tower- Black and White College Poster, you can look at it every day! That's what is so great about adding scenic views to your dorm room decor. You can have the scenic views you wish you could look at every day with the huge bonus of adding to your dorm room decor. Plus you'll be able to cover those bland dorm room walls with great wall decorations for dorms and make your college dorm room feel more comfortable and like home. Our Eiffel Tower- Black and White Poster for Dorm Rooms is a dorm essentials item that features a view of the Eiffel Tower not often seen in college dorm room posters. When you see cool posters for dorm rooms of the Eiffel Tower, the photograph is usually taken right in front of the Eiffel Tower and there isn't much else in the photograph. Our Eiffel Tower- Black and White Dorm Room Poster is a unique dorm necessities item that features the Eiffel Tower in a one of a kind view. This college supplies item features the Eiffel Tower in the backdrop instead of the foreground with buildings and trees surrounding the border of this college wall decor item. The view of the Eiffel Tower in the backdrop of this dorm wall art is absolutely stunning for dorm room decor!